Home » brakes » How long do brake pads last? Brake pads are part of the disc brakes that are used in automobiles. They are steel backing plates that maintain stopping performance of disk brakes. Do you know why your brake pads wear out? Have you ever wondered what affects your abrupt braking produce on your vehicle? If not, then read this article to know each and every action that damages your brake pads. What are brake pads and their life span? As stated above brake pads are the important component of disc brakes. They work as friction buffer between rotor and caliper. Being regularly squeezed on the rotor by the caliper they are most susceptible to damage. In general, It is estimated that brake pads last for around 40,000 to 50,000 miles run of your vehicle. But there are many factors that influence the longevity of the brake pads. Neither the quality nor the use can estimate the time period alone. According to Mr. Conrad, there are various factors responsible for the life of your brake pads. For understanding the durability of the pads it is important to study all the factors related to it. Hence, below mentioned are the major factors that work closely with the pads or influence their life. A good amount of knowledge about the factors is very helpful. They will help you to determine the approximate time period for which your pads will last. You might have seen people doing stunts with their cars and bikes. The way they rotate the bikes and suddenly come to the stationary mode. Well! We all love watching such activities and yes they are exciting as well. Have you ever wondered how this immediate stopping takes place? Thanks for all this to the disk brakes. If they weren’t engineered for the bikes and cars then you won’t have experience smooth and immediate braking. Disk brake offers a great braking experience and brake pads play a vital role in them. Brake pads are the components that face the disk brake rotor. This is the reason why you have to ensure their rigidity over time. Any kind of negligence can lead to a fatal accident. So, you should always get them checked and changed over time. Depending upon the use of the vehicle the brake pads are divided into many types. As of now, we know how important are brake pads for the safety. Hence, it becomes our responsibility to choose the right brake pads for our vehicle that not only properly supports well but also last for a long time. Adding incompatible brake pads to your car can lead to serious issues in its braking system. You can take the advice of automobile engineers to select the best brake pads for your vehicle. The brakes system constitute different components and brake pads are one of them. Any wrong choice in brake pads can lead to a serious issue in your brakes and their efficiency will be affected. Hence, it is important to know the number of brake pads in details. According to technician academy, there are 3 types of brake pads. Finish with all the types details for good amount of knowledge about the brake types. 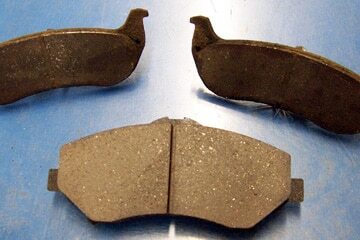 Metallic pads – They are the most common type of brake pads. You can find them easily in the vehicles. They are crafted of a unique metal. The metal provides them strength and durability. 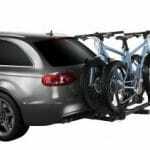 They are affordable and preferred for a smoothly driven vehicle. Especially for the small vehicles. Organic pads – As the name suggests organic pads consist of organic materials like glass, resin, and rubber that act as the binding agent between the pads. In old times asbestos was the major material used in organic pads because of its quality to dissipate the heat well. However, the effect of the dust produced by them was very dangerous to the environment. Thus, the replacement of natural material took place. If we compare organic with metallic pads you will find them less noisy and light in weight and ideal for small vehicles. They are very soft also. This is why they wear out fast. Ceramic pads – Both the above pads are preferred for small vehicles that are used for smooth driving experience. In case you are looking for a high-performance vehicle then ceramic pads are recommended for you. Whether you take sharp turns, drive high speeds and stop at frequent interval it won’t affect the ceramic pads much. They are expensive pads. Highly recommended for racing cars only. A good choice of braking pads is a major factor that decides how long do brake pads last? There are many materials that can’t respond well to water. If you have not picked a material that is responsive to water as well then your brake pads will fail. Brake pads can’t afford the failure and you might end up in a big issue. You pads material should be selected considering that it synchronizes with any situation and recover in any condition. Fast recovery pads are best suitable for your vehicle. The material that you have chosen should be able to build a smooth contact with the rotor to ensure smooth braking. As the name tells, it is completely metallic in nature. Sintered steel with synthetic additives is what defines this category. It lasts long but is highly preferred for racing cars only. It is high on cost and produces a loud sound effect. It is a composite in nature. It made with the combination of synthetic material. It is soft. Require less force on the rotor. If you are looking for a material that lasts long then this not a choice for you. Semi-metallic materials are the mixture of synthetic material and flaked metal. If we compare the efficiency then we can conclude that they require more force to generate torque. With longer life and resistance they are preferred over non-metallic materials. The cost of the material is high which directly influence the pads cost. Ceramic materials are a mixture of porcelain and clay. They are bonded with filaments and copper flakes, which add durability to them. They do not dissipate any heat that is the major reason of warp of other parts in the brake in small time. They do not produce any noise and preferred for ceramic pads. The above are the core factors that influence the life of brake pads. There are many other factors that are collaborated with time to study the life of the brake pads. Let us get into the details to know how long our brake pads last? Every individual has its own driving style. Your driving style affects your vehicle as well. A smooth driving will keep the parts younger for a longer time. But in case you are a rash driver, you have to bear high maintenance cost. Brake pads are highly affected by the way you press them. Many of us tend to apply hard brakes and stop the vehicle abruptly. Some people are smooth drivers who like to apply smooth and coast breaks. A gentle and smooth braking definitely increases the lifeline of your break pads. Hence, if you are a gentle driver than your pads will not ditch you soon. If you want to keep your brake pads health and efficiency maintained for a long time then practice smooth braking but do apply abrupt break in case of need. If not applied, then you have to bear the cost of complete car repair. Be alert and be gentle while driving your vehicle. Environment and climate are also the factors responsible for defining the longevity of your brake pads. If you live in a big city and use your private vehicle to travel to work then you will loose your pads soon. Traffic is the major problem in big cities. Regular braking can reduce the efficiency of the brake pads with time. Similar is the situation at high altitude. The steep slopes lead to more wearing out of the parts. In mountains, you have to apply brakes consistently to control the vehicle. Water is also the enemy of your brake pads. You tend to loose the grip of your pads in case of the rainy season. The more exposure of your brake pads to water, the lesser will be their longevity. In short, we can conclude that many environmental factors are responsible for determining the life of your brake pads and you don’t have control over them. A vehicle needs on time maintenance. Proper cleaning, maintaining the level of lubricant, changing necessary oils are some of the regular requirements. These are the things that should be practiced at regular intervals. Your vehicle maintenance guides state the time period or the miles after which you should get them done. If you don’t get your vehicle maintenance on time then you might loose some of its parts early. Maintenance increases the life and smoothness of the parts for a long time. A properly cared vehicle remains smooth for a longer time. Thus, maintenance is also a way of ensuring how long will your brake pads lasts. Brake pads are one of the hardest working parts of your complete vehicle system. The wear out is this part is most due to its usage. Basically, it converts the kinetic energy of the car into heat energy through the force of friction. Now, hard brake means more force and more force means more friction. In short, the summary of the life of your brake pads depends on the usability and the braking system. The braking system contains a liquid called brake fluid. Brake fluid is responsible for maintaining the smoothness of brake. In case you have lesser fuel then you have to press the brake hard and repeatedly to apply brakes. This directly affects the brake pads. Regular and hard application of brakes reduces the life of brake pads. So, it becomes important to maintain a proper amount of brake fluid in your vehicle. Checking such things over time will help you to maintain the brake pads for good amount of time. Always get your vehicle basic requirements updated over time to avoid their effects on the working of other parts. It is not easy to determine how long do brake pads last? There are a lot of factors responsible for it. They are personal as well as core factor. To determine the status of your brake pads you can book an appointment for service and can get the car checked up. It is important to keep them in good condition. If you want to know how to check the brake pads at home then you can refer this video “https://www.youtube.com/watch?v=Y70ZHV6-ufI”. It will also explain to you how brakes work. It will give you the details on checking pads with proper instructions. At Last, I would say that we couldn’t control the environment factors. But if we improve our driving habits, we can ensure long life to the brake pads. Buy quality pads and get them replaced on time for the safety of your loved ones.